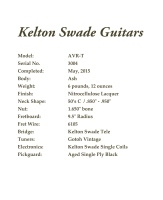 Back in 2015 I purchased a small batch of guitars fresh off the workbench of Kelton Swade. 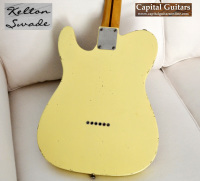 Kelton makes hand built and aged replicas of Tele and Strat-style guitars at his shop in Tennessee. His guitars are used by the likes of Vince Gill, Keith Urban and many, many other icons of country and rock music. 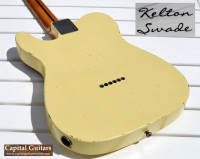 Offered here is last of those I purchaded, an AVRT (Authentic Vintage Reissue T-style) guitars, a model that is Kelton's take on a well-played 50's Fullerton blackguard. This guitar has an extremely light Ash body with a total guitar weight of just 6 pounds, 12 ounces. The finish is vintage blonde nitrocellulose lacquer that has been meticulously aged. The Maple neck has a 9.5" radius, 6105 fret wire, a 1.650" bone nut and a medium C-shape with depth measurements of .850" at the first fret increasing to .950" at the twelfth fret. The bridge is a classic T-style with brass saddles. 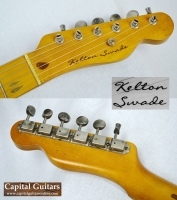 The pickups are Kelton's own hand-wound single coils mated to a modern Tele wiring setup. 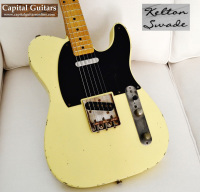 As Kelton intended, this instrument will feel quite familiar to you if you have ever had the privilege of playing a real vintage Telecaster. This guitar accurately replicates the look, feel and tone of the classic upon which it is based. This 2015 instrument is new and unplayed and comes with it's original hardshell case. Authorized dealers charge $3,750 or more for this guitar, but you can get this mint example for less than what a dealer would pay for it! A great buy on a hand-built Tele replica. Make it yours!